In this book, philosopher and spiritual teacher Neil Kramer offers a heady and fairly intense guide to personal Gnosis. The serious, often elegant prose of the book provides deep insight into his mystical philosophy, as well as his numerous lines of sceptical enquiry. Kramer is often provocative, sometimes enlightening and always fiercely independent. He comes across as a guru of quasi-nihilism who has trodden the lonely path of the adept and who now shines light upon the path to "Unfoldment". Kramer rejects many aspects of contemporary life, especially those which continually distract us from our deep, spiritual destiny: TV, 24/7 communication, obsessions with news events (especially those offered in the mainstream media), and even many social mores that many of us accept as an intrinsic part of human existence. We have been fed a model of reality from birth that is a distortion of the truth (p82), and serves only to encase us within a nefarious matrix of thinking that dulls our wits and leads us up spiritual blind alleys. Those who rebel are considered by society to be mentally ill, says Kramer - although one might equally argue that many of the rebels who see beyond the matrix instead become artists, innovators, and creative geniuses who drive society towards new wonders. Not so, I suspect Kramer would counter, as we all create our own narratives, like an actor who gets obsessed with his or her part - and this blinds us to the reality within ourselves, no matter how well our insights and talents leads us to horizons new. I'm so agnostic that I'm not even sure I am one! As an established fence-sitter, I have trouble accepting the complex spiritual picture Kramer builds, because, quite honestly, I'm not sure that it isn't any more of a distortion than the common reality he's trying to get us to question. Kramer is not really agnostic, it turns out; agnosticism is a step towards a deeper realisation - that of rejection of the polarity of belief and disbelief - and is surpassed by spiritual experience (p105). But why argue for agnosticism when in the next breath you're presenting a complex series of spiritual ideas for the reader to believe in? I think this offers a flavour of the complexity and sometimes contradictory qualities of the work Kramer presents. Another example of this dichotomy is his discussion of various conspiracy theories. Despite his wider rejection of the contemporary news circus, he works through many alternative ideas with some passion, especially those with a British flavour. I think he's at his best when discussing such issues (particularly the section on crop circles); his cynical and unrelenting analytical style serves him well here. Generally, the book is a diatribe against modernity's lack of deep thinking and the many factors that have contributed towards the decline in intellectualism within contemporary culture. But embracing the world according to the Internet is like playing Russian Roulette. There are still trustworthy sources of information in the mainstream media, thankfully. His acerbic analysis of social mores often fails to see that these stem from the natural human condition. I had a friend like Neil Kramer once, and as much as I enjoyed the intellectual quality of the debates we had, I often used to just wish he'd lighten up a bit. I felt the same reading this book. Many New Age books discussing spiritual matters are happy-clappy affairs, so one can take life-affirmation to the opposite extreme, too. The New Age movement needs to strike a better balance. A possible conduit for life-affirmation that Kramer might have explored to regain that proper balance is Art. As a student of the arts, he is well placed to bring that to bear as part of his mission to promote spiritual development. I would have liked to hear more of his challenging theory that even "doodles are fine art" (p157). He described a fellow traveller called Zara who immersed herself in New Age philosophy before moving onto art. Actually, I think her positive approach to life and her love of eclectic learning is something to be applauded. Art really does have a great deal to offer, especially for the questioning mind. As does some of the current television offer in Britain that the author wholeheartedly rejects. (Perhaps Kramer should listen to Eddie Mair on Radio 4's PM programme for some sardonic sangfroid in the field of current events; or watch some of Jonathan Meades' off-the-wall documentaries for modern enlightened intellectualism). It's that kind of depth of thinking that makes this book stand out among so many other New Age offerings. If you wish for your spiritual journey to be guided by a profoundly deep, somewhat sceptical philosopher then this is the book - and path - for you. 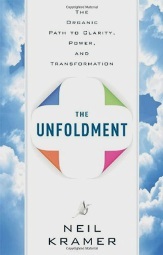 Subtitled "The Organic Path to Clarity, Power, and Transformation"